Shanna and her team were exceptional to work with. I was so excited and happy with every little detail! The Round Barn is a stunning venue and really didn't need a lot of decor, which was nice for budgeting purposes. They were very easy to work with and helped me with ideas and formulating the perfect wedding!! It was a fairy tale for me and I was so happy with the end result!! Shanna and staff were amazing with getting things organized on the day of my reception. They were very flexible and had lots of menu options and drink options to choose from. We loved our experience with Bayou Bluegrass Catering! Our wedding weekend was perfect! The Round Barn was such an amazing place to have our wedding. The staff was amazing and so professional. I am so happy with my choice. This venue was my dream venue. Aside from being beautiful, and in the heart of my favorite city, Shanna and the employee's are so great to work with. The amount of work they do for you makes the day go so smoothly and we couldn't have asked for better! Everything was perfect, from the food and service to the details they made sure were taken care of. I highly recommend! 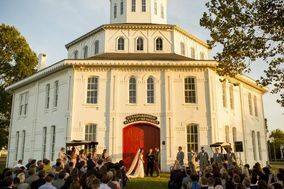 The Round Barn is a completely magical venue! Our reception was here and it was amazing. All of our friends made comments about how wonderful the place was. Shana was amazing. She gave us a preferred vendor list, decorated the venue gorgeously for us, and the food was amazing!! They were so helpful with planning and made it less stressful. The roundbarn is an absolute dream come true in Lexington. Super friendly and flexible coordinator. The food is excellent and the environment is totally unique and quirky. The crew here goes above and beyond to create your perfect day, no matter what you want! They are very accommodating, especially when you change something previously agreed on. I would recommend this beautiful venue to anyone! Can't imagine our day being anywhere else!! Thank you to Shanna for working with us every step of the way. Along with her guidance we were able to get everything just the way we wanted from 600 plus miles away. Along with Shanna her staff was amazing an every one was so helpful and friendly everyone said something about it. Our food was amazing and I don't know the words to express how happy I was to find that Shanna had made my husband an I to go boxes to take back with us to our hotel. Only downside is no AC but plan accordingly with rentals an the amount of people and you will be fine. The Red Mile staff was excellent to work with. Any questions or concerns we had were quickly answered and they offered great advice. They were amazing to work with from day one and we had no issues during the entire process. We can not thank them enough for making our wedding day go so smoothly and allowing for an amazing venue that our guest raved about. We had such a wonderful experience having our wedding at the Round Barn. The whole team was wonderful in making sure that our day went off without a hitch! Shanna was so helpful through the whole planning process and was very on top of everything! She answered all of our questions (we had TONS) and assisted in anyway possible. I don't know what we would have done without her and her team! Food and drinks were also PERFECT, tasted the same as when we did our test run!!! !The Round Barn is a truly magical place for a wedding and/or wedding reception and I would highly recommend the venue! We honestly did have the best day ever and it would not have been possible without the amazing venue and the killer team that makes the venue come to life!!! I cannot rave enough about this venue. From the first moment I walked in with the Bride and Groom, we knew this was the one! Shanna and her staff were so accommodating. They let us drape and turn this into a magical setting! We cannot thank them enough for their hard work and professionalism. I will always highly recommend this venue to all my Brides!